This Christmas card image is of Mono Lake near Lee Vining, Calif. Mono Lake, known for salinity and tufa formations, is at least 760,000 years old, according to information on the back of the card. The Christmas card, the first I received in 2010, was sent to me by longtime friends, Rick and Michele. The foggy, rainy prelude to an even bigger late-fall storm was brightened considerable on Friday when I received two unexpected packages in the mail. One was a lovely Christmas card from dear long-time friends Rick and Michele of Vacaville, Calif. I have known the two since August 1990 when I joined the staff of The Daily Democrat in Woodland, Calif. Rick was the photo editor and Michele was a sales representative for the newspaper. I have spent holidays and vacations with them over the years, and I was the best man at their wedding. 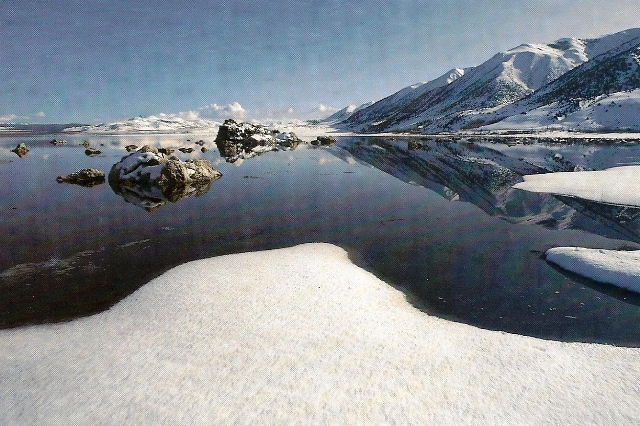 The front of the Christmas card showed a lake with snowy mountains and snow-covered rock outcroppings and their reflection in the water. It is a lovely image. On the inside Michele had written “Recognize this lake?” and a smiley face. Lake? What? I know this lake? What lake is this? I had to look on the back of the card to learn that it was Mono Lake near Lee Vining, Calif. 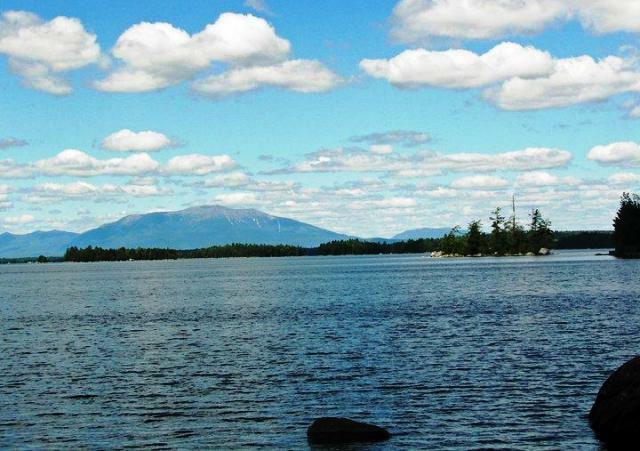 I had not recognized the lake even though I have been to its shores and visitor center countless times! 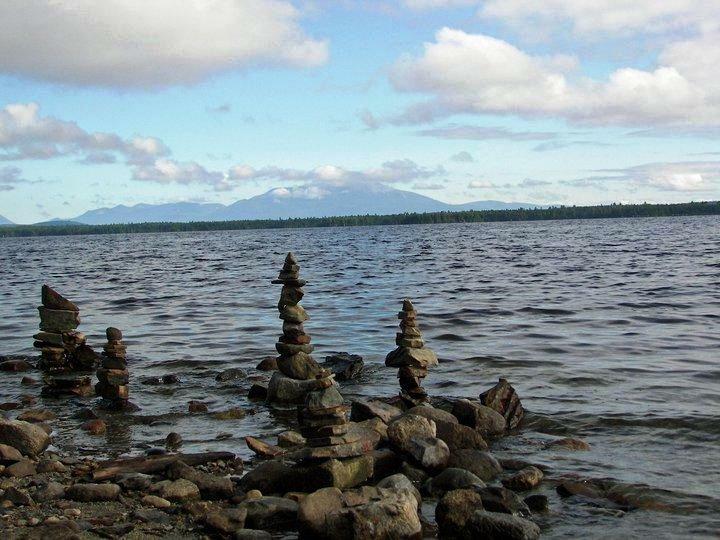 What threw me off were the formations in the water; they looked like typical rocks, not the tufa formations for which the lake is known. Mono Lakes does not have natural outlet and is two or three times saltier than the ocean. It is a natural nesting area for California’s seagulls. Brine shrimp, brine flies and tufa are pretty much all that grow there. The iconic tufa image – very similar to the wallpaper I have on my cell phone screen so I should have recognized the lake in the first place – are more like cylindrical shafts shooting out of the water. The lake was much deeper before Southern California water districts diverted water from the lake decades ago. The briny water caused each of the tufa formations to build onto itself until each reached the surface. The water diversions lowered the lake levels, exposing the tufa. They remain exposed even now even though the diversions have ceased. In my defense, the photo, which was taken by Roy R. Goodall of Seattle, Wash., seems to have been taken along the east shore of the lake, a section I have not explored as much as the south and southeast shores. And it has been a while since I have seen Mono Lake in snow. No matter what, it was still a very pleasant surprise. Rick and Michele, I thank you both. The second package was a bit more of a surprise than the Christmas card. 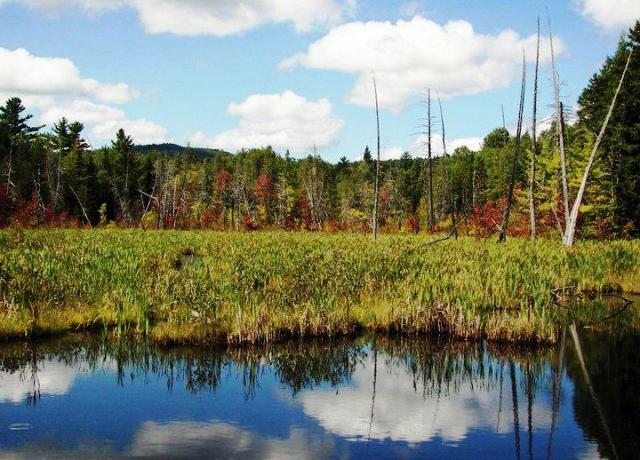 It was from a childhood acquaintance now living in Presque Isle, Maine. Penny is the daughter of pals of my parents and they owned the cottage next to the one where my mother lives now. Penny was a class or two before me in high school and I’m guessing every guy in my class had a crush on her – girl-next-door looks and long blond hair. This is an image of my father probably taken in June 1982. It was one in a stack of photos a childhood friend – the daughter of my parents’ friends – recently mailed to me. I am unsure who might have taken the photo or where exactly it was taken. 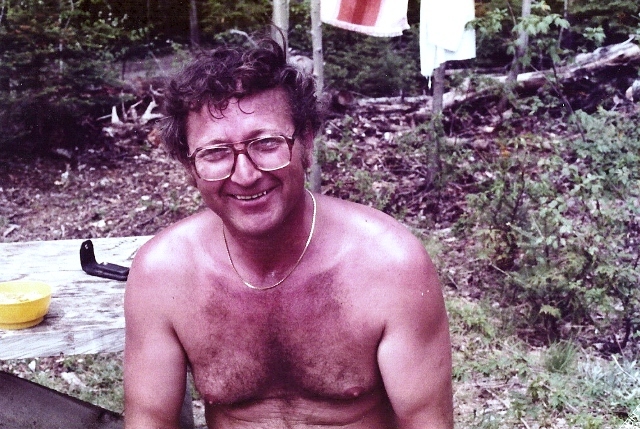 She and I reconnected over the summer via Facebook and not very long later she sent me an email that she had come across a few photos of my father, who died in July 1991. She offered to send the photos, but deep down I really did not think I would ever see them. Do not get me wrong – I’m sure Penny’s intensions then were to send them, but I also know the realities of life. We all are pulled in so many directions that it becomes difficult to find time for family and ourselves, let alone mailing photos to childhood acquaintances. The second package I received was not just a photo or two of my father, but a stack more than an inch thick! Nearly none of the photos have dates on them, but I am guessing they have to be from the late-1970s to mid-1980s. They show my father, mother, Penny’s parents and others from my childhood. Nearly all of the photos were taken during “down-time” – weekends at the lake or at North Woods cabins, vacations to Florida, on camping trips, and even one taken of my father coming out of an establishment called “Dirty Old Man’s Shop” with additional signage of “Adults Only.” I’m guessing they were seeking out, um, a public restroom or directions. Yeah, that has to be it. 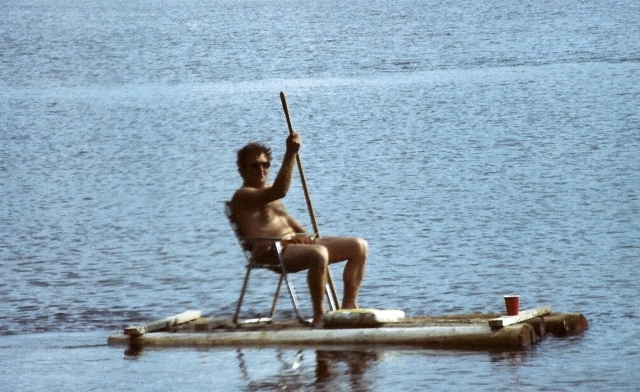 Here my father is poling a log raft that I’m guessing he hammered together on a whim one summer day in 1983. Personal flotation device? Yes, at this feet. Provisions? Yes, in the red cup at the “bow” of the raft. This also was among the photos recently mailed to me by a childhood friend. There are shots of my father paddling a canoe and poling a log raft that I have little doubt he probably nailed together on a whim shortly before the photos was taken. 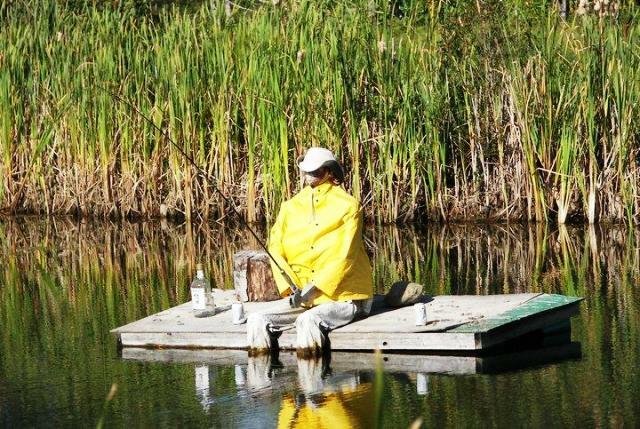 He is sitting on a folding lawn chair perched on the log raft, a boat seat pad/flotation device at his feet, and a plastic red cup balanced on the bow in which I’m assuming was a chilled adult beverage. 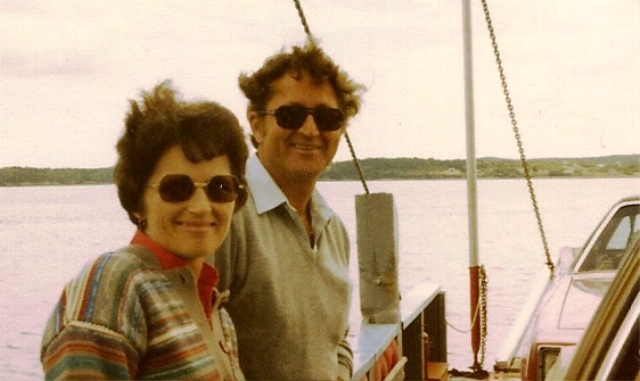 Here are my parents on a small vehicle ferry. I am unsure where and when this was taken, but the date on the back of the photo says it was developed in October 1981. I like this photo. There are photos of my Dad and Mom together in happier times; they both are flashing genuine smiles. It is nice to see that just before Christmas. This was another photo among the stack. That is childhood friend, Todd, at left, and I suspect that is the back of my head to the right. We were watching my small black-and-white television, probably trying to catch a Red Sox game. The date on the photo indicates the photo was developed in July 1982. There are other photos, too. There are a few photos of my sister – wearing glasses that are far too large for her face, but were the fashion at the time. One of my Mom in a Christmas sweater; I will not comment on the fashion sense involved. 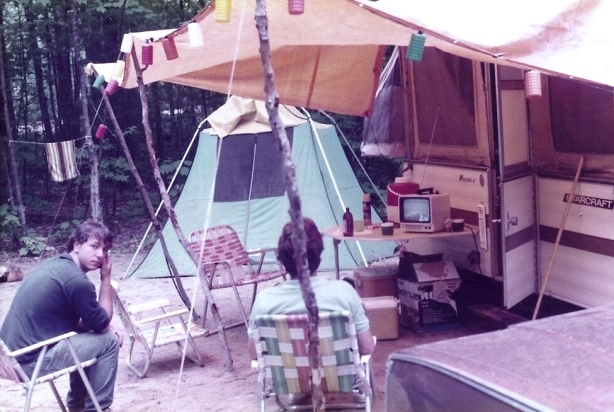 There is a photo of a childhood friend, Todd, and what I believe is the back of my head watching a small black-and-white television while on a camping trip, although I cannot recall the location. 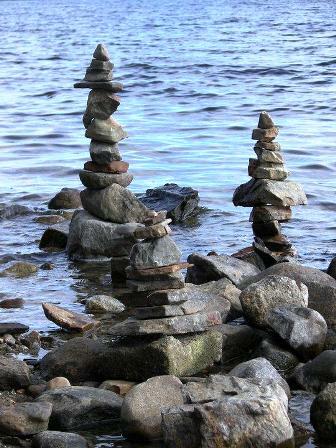 It might have been at a campsite near Sebago Lake. 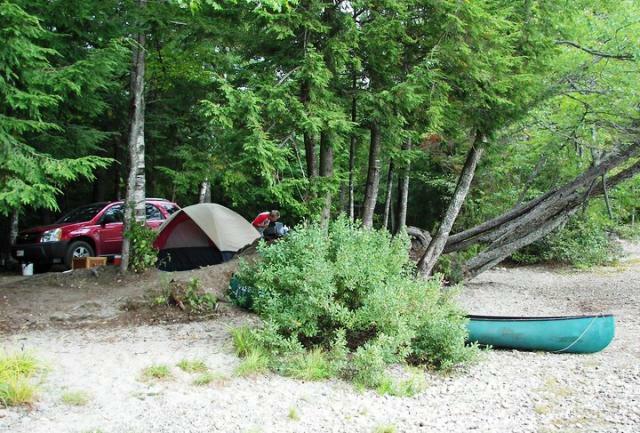 There is a photo of Penny standing next to my family’s Caprice Classic parked near the family’s tent camper during the same camping trip. And there are several of my Dad and Penny’s Dad, Dana. It was heartwarming to see some of the photos from my youth. It was a reminder of much happier time. It was very nice of Penny to send the photos. It was a nice early Christmas gift. Thank you, Penny, and Merry Christmas. 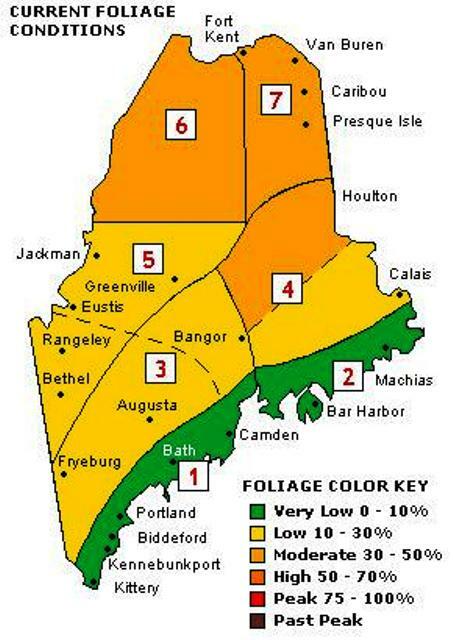 Maine foilage map for Sept. 22. I just spotted two middle-aged white guys fist bump on the patio of the coffeehouse and thought it, um, odd. Is there an age limit on fist bumping? One Facebook friend says that it’s all a matter of “coolness quotient” and she says I am cool enough to pull it off, even if I am 48. Another Facebook friend says 17 is the limit and another says I should find another place to hang out. But too many pretty college girls come in and it would cut into things I can post here. Oh, the sacrifices I make. Mitchell Montpetit, who graduated high school with me – Ashland Community High School, Class of 1980 Go Hornets! – may have summed up Maine for this time of year. This is his Facebook post from yesterday. In a 4 hour period today I went from sunny and warm, to windy and rainy, then into a snow shower and ended it all by being bit by a mutant blackfly that only got mad when i smacked it, you’ve got to love Maine! Actually, I do love Maine and for some of the very reasons in Mitch’s post. OK, this really isn’t one of my coffeehouse observation, but his came to me via a former co-worker and Facebook connection who happened to be in the same coffeehouse that I frequent. The guy he is commenting on is a bit, um, unusual. He frequently talks to himself, paces quite a bit – as the observation notes – and he does create some rather detailed pieces with ink on the reverse side of paper grocery bags. Trust me, we are not making fun of his challenges; however, one day I did witness him have an argument with himself … and lose. AUBURN, Maine — Their fans on the social networking site Facebook are being credited by the Auburn Police for helping the department solve another crime. Fan tips made it possible to summons a theft suspect within 24 hours of the crime, Deputy Police Chief Jason Moen said in a prepared statement Friday. Here’s a link to the rest of the story.